Nikkita Oliver, who finished third in the primary election, figured into the heated exchange between candidates Jenny Durkan and Cary Moon. 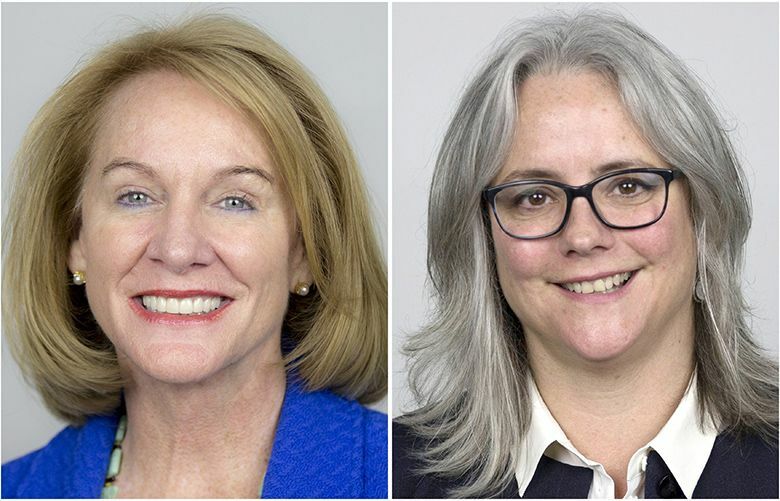 Seattle mayoral candidates Jenny Durkan and Cary Moon clashed over donations, wealth and privilege during a debate Wednesday night, pulling primary opponent Nikkita Oliver into the brawl as her voters weigh their options. “People like Cary Moon always want to point to big corporations,” the former U.S. attorney responded. Moon replied by praising Oliver, who was sitting on the panel, and by linking Durkan to former Mayor Ed Murray. Murray endorsed Durkan in June and resigned last month amid accusations that he sexually abused teenagers decades ago. Then Moon mentioned the $525,000 that Seattle Metropolitan Chamber of Commerce’s political arm recently contributed to People for Jenny Durkan, an independent-expenditure committee. Durkan took the microphone from the moderator, determined to fire back. “I need to respond to that,” she said, noting that she also is a first-time candidate and collected many donations before Murray’s endorsement. “The one thing I haven’t done with wealth is fund my own campaign,” Durkan said, referring to Moon, an urban designer, who is spending about $141,000 of her own money on the race. The rivals circled back a few minutes later, when former Mayor Mike McGinn, also sitting on the panel, again brought up People for Jenny Durkan. Such committees can take unlimited donations and spend unlimited amounts to support a candidate, so long as they don’t coordinate with the candidate. McGinn has endorsed Moon. “I have no control over it … and I’ve called for them not to do it,” Durkan replied, then pivoted back to Moon’s personal spending. “We are both very wealthy women, Cary Moon and I,” she said. Oliver won about 17 percent of the primary vote, finishing behind Moon by 1,170 votes. Durkan was first with about 28 percent. Earlier, Oliver had said she wouldn’t be endorsing either candidate but said her supporters want to know for whom to vote. She put the question to Moon and Durkan, asking what solutions they would offer to her supporters. Moon said she would “share power across race, class and gender” at City Hall and would use “a racial-equity lens” in allocation of money. “I’ve already started with that process by offering you two seats on my transition team,” she said. Durkan pointed to her track record. “I’ve been showing up in the community for a long time, for 30 years,” she said, citing her criminal-defense work as a lawyer and civil-rights work as U.S. attorney.